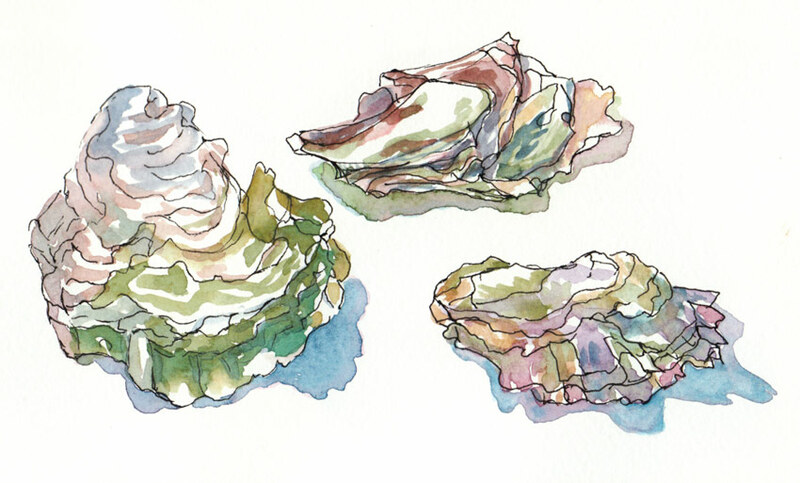 When I had lunch at Hog Island Oysters a few weeks ago, I asked for a doggy bag to take home these oyster shells so that I could sketch them. I finally did it, and enjoyed drawing all the rumples and bumps and ridges. Then I painted them with gouache and voila! another sketchbook completed. I’m finding that using M. Graham and Schmincke gouache paints as if they were watercolors is a very pleasing way to work. I haven’t quite gotten the hang of using them properly opaquely, but using them transparently is quite exciting as they have more pigment load than regular watercolor. To see if I could figure out what I was doing wrong, I studied my beloved Moira Kalmanbook, The Principles of Uncertainty, since she paints her wonderful, quirky illustrations in gouache. I saw that what I was considering flaws and errors in my application are actually—at least in her work— just part of the character of painting with gouache. Gouache is such a flexible medium. You can use it opaquely, flat and smooth as in posters; painterly like with oil paints; or transparently as if it were watercolor. Now I’m craving oysters again — some to eat and some to paint. You’re making me crave oysters AND gouache! These are delightful, Jana – painted so unfussily and with adventurous yet subtle colour. These are really lovely – very delicate and almost pearlescent with the colors you used! And just the perfect time for the EDM Shell challenge! Not a fan of eating oysters but love looking at the shells! The one on the lower right is really gorgeous. Nicely done! These are beautiful! I have never really tried gouache but you have inspired me! Thank you for sharing! About tumblr … Well my blog is where I write stuff I want to share with the world. My flickr is part photo album and part portfolio. They’re both MY stuff. The tumblr I use as reference of OTHER PEOPLE’s stuff really. Might not be of any use to you, but I found I was downloading images off the web regularly as sources of inspiration; but they all went into a folder and I found that I’d forget where they came from or who the artist was; and so looking for newer similar stuff from them became difficult. With tumblr you can download this little application that sits on your browser bar, and any time you find something you like, you can kind of ‘bookmark’ that image/site/whatever (I tend to do just images) by clicking on that button. That generates a post on your tumblr account. One, it links back to the artists website (I often only link to my favourite image of theirs knowing that I can just click back to their website; two, its online, I can show other people what I’m talking about even if I don’t have my own computer on me, and three, at the moment I’m also using it to ‘scrapbook’ ideas for my wedding (hence every so often you’ll get wedding-related imagery). I could have just easily bookmarked but it makes so much more sense to me to have an image, rather than a url. Lovely painting and really interesting blog notes, Jana. I haven’t used gouache but I’ve been wondering about it lately, and whether I could manage it for a project I’m about to begin. So I found what you had to say very instructive — and I love the Kalman book, too.